It’s back. The celebration of gluttony known as the L.A. Street Food Festival is back for the sixth time, touching down at Pasadena’s Rose Bowl on Saturday, from 3 p.m. – 8 p.m. Here’s what to know before you get on the 210 or hoof to the Gold Line. PRICE: First things, first. All you can eat, all you can drink tickets are going for $60, which includes parking. If you’re fancy, VIP tickets can be purchased for $90, and include early admission, special parking, special entrance, and a fancy person lounge. VENDORS: Over 100 food truck vendors will be on hand. Famous names include Bling Bling Dumpling, Middle Feast, and Mariscos El Mazateno. Brick and mortar favorites like Faith & Flower and Greenspan’s Grilled Cheese will also be doling out street-inspired eats. COOLING DOWN: The popular ice cream social returns, with treats from Sno Creamery, McConnell’s, and Peddler’s Creamery. Salt & Straw will offer an exclusive flavor called “Papi’s Salted Nuts,” which was created in partnership with Roy Choi and combines salty Chinese boiled peanut ice cream with a Southeast Asian marshmallow fluff. ARTISANAL OPTIONS: This year offers an exclusive area for organic eats, with food from Indie Jams and Sriracha Macha there for the eating. BOOZE: There will be no shortage of craft beer, featuring brews from Angel City Brewery, Golden Road Brewery, Singha, and Stella Artois, as well as a Tequila Tasting Tent. 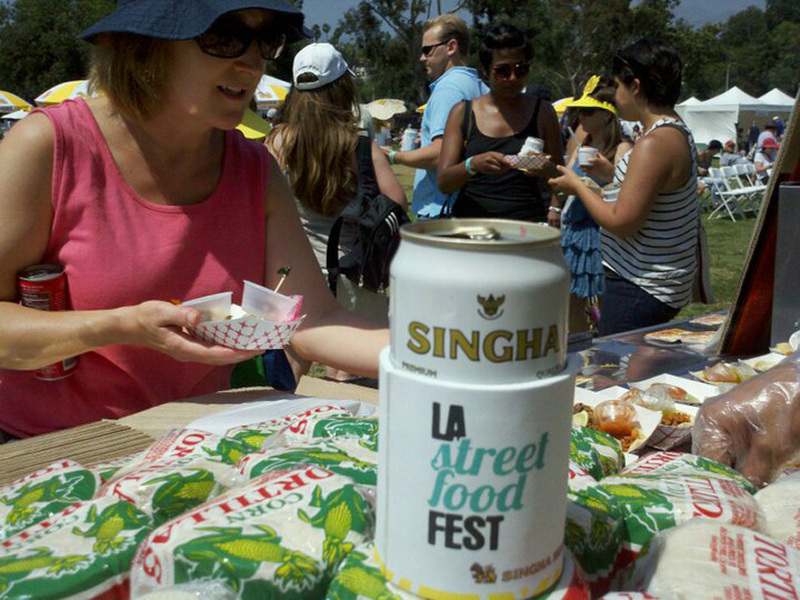 COMPETITION: The best street food will be crowned, with famous foodies judging like Birch & Bone’s Amelia Posada, L.A. Times’ Jonathan Gold, and Los Angeles magazine contributor Leslie Balla.